This article is the sequel to the one on the English Revolution. A few years after being bulldozed into acting out of character by an unprecedented of alignment of Saturn, Uranus, Neptune and Pluto and killing their King, Charles I, the English people had a serious attack of insecurity and asked his son to come back and take the throne. 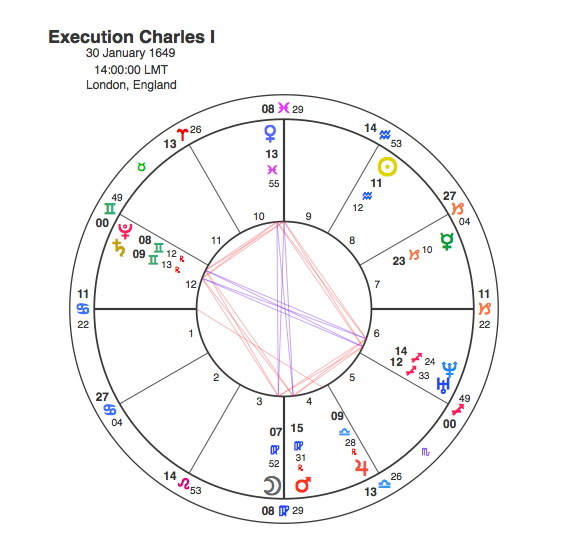 The Return of the King, Charles II would not have been expected in 1649 when his father was executed but if someone had look at his chart, that would have been a different matter. 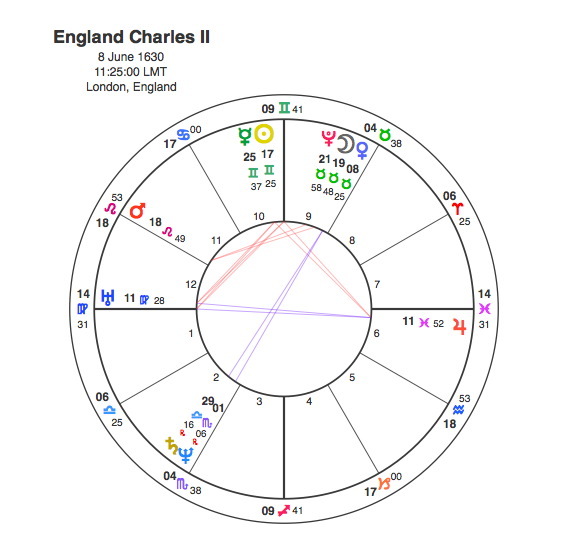 Charles II had the Sun in Gemini in the 10th house conjunct the Midheaven, as clear an indication as possible that he would ascend to the throne. The fact that his Sun was at the apex of a T Square meant that he would be thrust into high office as a result of events around him. By all accounts Charles had a happy childhood, gallant, careless, good-humored and irresponsible, a fine sportsman who loved the outdoors. The Moon is the planet that most describes our childhood experience and its auspicious position in the sign of its exaltation in Taurus attested to this. The trouble was that Charles’ Moon was conjunct Pluto so some kind of drastic event would cause a massive upheaval in his life. Of course everything changed when his father was executed, an event that would naturally affect critical areas of his chart. It would affect him personally so we would assume his Ascendant would be targeted but also his career as future king would be blown apart so his Midheaven would be decimated. The unprecedented Grand Cross that included 7 planets that despatched Charles I, fell right on Charles II Ascendant / Midheaven axis. The same Pluto / Saturn conjunction that ended his father’s life by transiting his Sun in 1649, landed on Charles II’s Midheaven ( career ). The Moon / Mars conjunction was on his Ascendant. Despite the Scottish Parliament proclaiming Charles II King after his father’s execution, the English Parliament made this unlawful. The English Revolution paved the way for the English Commonwealth, and the country was a republic, led by Oliver Cromwell. Cromwell defeated Charles II at the Battle of Worcester in September 1651, and Charles fled to Europe. Charles’ Sun was the apex of a T Square made up of an exact opposition between Uranus and Jupiter at 11 degrees of Virgo and Pisces respectively. Pluto reached 11 degrees Gemini, in square to these two in 1651, resulting in Charles’ sudden ( Uranus ) travel abroad ( Jupiter ) as a retreat ( in Pisces ). Cromwell became virtual dictator of England until his death in 1658 but the political crisis that followed resulted in the restoration of the monarchy. Cromwell’s death was the turning point in Charles ‘ life a fact that was confirmed by Pluto’s conjunction to his Sun in 1658-9. It was still within range to have an affect when Charles was crowned in 1660, but the coronation occurred with Jupiter conjunct his Ascendant. Remember Jupiter in Charles’ chart was opposite the ascendant and it symbolised his flight to the Catholic countries of Europe, so it was only fair that Charles journey back and his ascending the throne came with Jupiter and the other side of the chart, conjunct his Ascendant. Jupiter as any classical scholar will tell you was the King of the Gods. So Jupiter coming to the Ascendant meant The Return of The King. So the English Revolution that required such a massive astrological kick from the 4 heavyweight planets, lasted a mere 11 years and then they went back to having a monarchy again. The rest as they say is history. Every other major country worth its salt has ditched their monarchs for good but we’re still stuck with ours. Over 300 years later Pluto had a go at getting rid of them by undermining them from within in 1992 but to no avail. The English Revolution was an exceptional period in our country’s history even if it was followed fairly quickly by the Restoration. Both events were heralded by Pluto’s transits which just goes to show that revolution or counter revolution, in the end who cares, it only goes to show that Pluto doesn’t take sides, its just likes to blow things up for the sake of it.